It is staggering to me how much time I’ve spent on preparing for this hike, while the issue taking up most of my time hasn’t been what you might think. I know that it is crucial that I understand how my gear works, so I’ve used my stove and watched many Youtube videos of how it all fits together and actually works. I’ve taken out and set up my sleeping pad and sleeping bag, so I’ll know what to do on my first night. I’ve even ordered a silk sleeping bag liner in order, according to a rather slimy looking guy on Youtube, to prevent my body oils and odors contaminating my sleeping bag. Nice. I’ve spoken to many people, and read many books and even recently joined the Florida Appalachian Trail Club to try to absorb as much of their experience as possible, as if by osmosis. They say that failing to prepare is preparing to fail, so I am confident that I’ve worked out most of the early kinks that will hit me on the Trail. However, one thing that I have been unable to resolve – until now- has been my trail name, that secret identity that apparently all hikers take on when they first step into those daunting woods. An earlier post referred to “King” and my reasons for that name. Since that post, I’ve been uncomfortable with not only the inference of the name but also the amount of explanation that it will take on the trail if I’m not to be thought of as a totally arrogant Brit. I think the arrogant bit is a given; I’m just trying to control the degree. Then, over the weekend, I was putting together more things for my pack and decided that I wanted a warm hat. I intend to shave my head two days prior to the hike and will probably need that bit of extra protection and warmth. I was rooting around in my closet, looking for just the thing when I came upon the little ensemble you can see on the right. I’m aware that it isn’t a good look, in fact. I’m aware that I look faintly ridiculous, but please bear with me. I have been in love with football (soccer to my US friends) for all of my life, in that irrational and entirely unreasonable way that men love sport. For many of my fellow Brits, that means supporting the top team of the day, be they Manchester United, Arsenal or Chelsea, yet, for me, there could only ever be one team. I first went to see Southend United with my Dad in 1959 and I was immediately, and remain to this day, irredeemably hooked. I even went to see them on the evening after my Dad’s death, in 1994, and the sight of his empty seat in the stands remains one of the most poignant sights of my life. After I divorced wife #2, I started going with my lovely niece, Emma, and she is now my football soulmate. When I moved to New York in 2005, I retained my season ticket for three years and would often fly back to the UK for the sole purpose of going to a game with Emma. In one season, I went to 10 games. As I say, completely irrational. 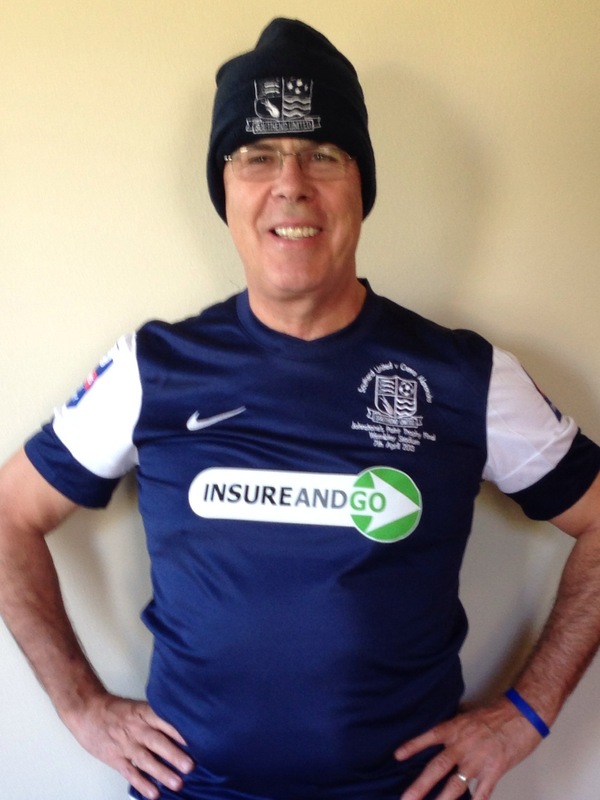 Southend United are, at best, a mediocre team and, for reasons passing understanding, they were suddenly referred to by their supporters as the Mighty Blues. As you can see by the rather smart outfit in the picture, the “Blues” bit is clear, yet the “Mighty” part is somewhat more elusive. Southend United have never played in the top league and we have never won any competition of significance. For my American friends, it is a bit like supporting the Staten Island Yankees instead of the New York Yankees. Anyway, the name suddenly seemed to fit me. Like Southend, I have never hiked in the “top leagues” and my hiking record, thus far, is mediocre, at best, with a few 5 and 6 mile hikes under my belt. I intend to try my hardest to change my hiking “cred,” but now feel boosted by the only name that really fits me like a glove or, in this case, a hat. Say hello to Mighty Blue. I like it! But have to warn you that once on the trail you might earn a new trail name as this is the way many of us have acquired ours! I can see from your name that it probably wasn’t your first choice! Sounds painful. I’m glad I found your blog Steve… and I look forward to you as you hike up the Trail! Thanks Ed. It is gratifying to see my extended family get behind me on this great trip. Mighty Blue is interesting, but to me you will always be Big Steve Grizzly Adams! Have fun old mate, stay safe, and don’t let the bugs bite!